Diving in a cenote cavern is an unforgettable experience. Cenotes, which are only found in this part of the world, offer certified recreational divers the opportunity to explore something different! To allow recreational divers to safely experience the wonders of this underwater world without becoming cave certified and equipped, the diving community has made the cavern dive distinction. 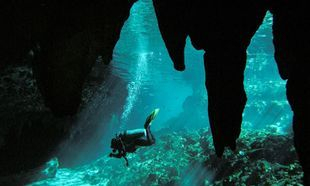 Almost all cavern dives can be performed by divers holding an open water certification, basic, one star, or any equivalent first level certification. We offer about 18 different cenotes cavern tours in the area between Playa del Carmen and Tulum...each cavern having its own personality filled with subtle variety and astounding beauty! All cavern dives are safely guided by one of our professional guides in the “daylight zone” of solid overhead in line with internationally accepted cavern standards. Our guides are full cave certified by a recognized agency and are either instructors or divemasters, with hundreds of dives in the local environment. They are knowledgeable and experienced in the local cenotes systems above and below the ground. Adhering to international standards, we never exceed the ratio of divers to guide which is four to one. If you enjoy diving and are in the area then you should not miss the opportunity to try a cavern dive…and if you like it you may even want to take a cavern or cave certification course! As with any other activity, there are clear and distinct limitations to cavern diving and it is of prime importance that divers be well aware of the limitations imposed and strictly adhere to those limits at all times. Divers must remain within the No Decompression Limits of the dive computer. Please contact us to receive more information about cavern diving or to make a reservation. Click here to see our complete list of cavern diving sites or find out more about our Cavern Diver Course. Continue to read more about cave diving.